Quickly share that special moment — at family gatherings, parties and more — with the compact, portable PictureMate PM-400 wireless photo printer. This lightweight printer delivers beautiful borderless 4&quot; x 6&quot; and 5&quot; x 7&quot; photos. Featuring wireless printing, plus Wi-Fi Direct&reg;1, it prints from your iPad&reg;, iPhone&reg;, tablet or smartphone2. Use the 2.7&quot; color display to preview photos. The PM-400 prints 4&quot; x 6&quot; photos in as fast as 37 seconds3. Get stacks of photos with convenient Print Packs (includes ink cartridge and 100 sheets of 4” x 6” photo paper). Photos are smudge, scratch, water and fade resistant4 and last up to 200 years5. Quickly share that special moment — at family gatherings, parties and more — with the compact, portable PictureMate PM-400 wireless photo printer. This lightweight printer delivers beautiful borderless 4" x 6" and 5" x 7" photos. Featuring wireless printing, plus Wi-Fi Direct®1, it prints from your iPad®, iPhone®, tablet or smartphone2. Use the 2.7" color display to preview photos. 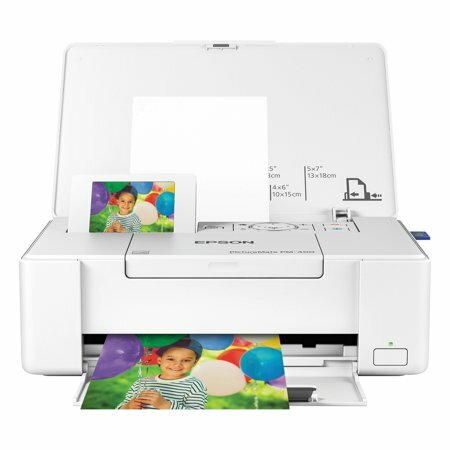 The PM-400 prints 4" x 6" photos in as fast as 37 seconds3. Get stacks of photos with convenient Print Packs (includes ink cartridge and 100 sheets of 4” x 6” photo paper). Photos are smudge, scratch, water and fade resistant4 and last up to 200 years5. I've had this printer for over year now and it is still going strong. It's light weight and portable. 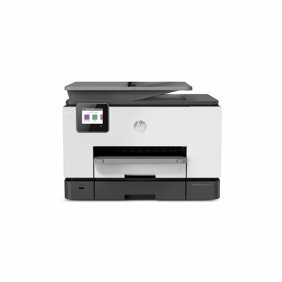 I'm a event photographer and I use this printer at all of my events offering 4x6 and 5x7 printed professional pictures during the event, my customers love it. This printer has exceeded our expectations. Being able to print photos straight from our phones is just wonderful, as well as being able to print from the computer. With so many pictures in digital format these days, we were worried that we wouldn't have any printed off in the future and would look back with regret. This printer is something we are going to really appreciate. The quality is plenty good. The printer is easy to use. I would highly recommend it and would buy it again. The picture mate pm-400 is a wonderful printer, that prints 5 x 7 fast and has remarkable color. The only problem that I have found with this model is that none of the stores carry the ink for this product, which is a real disappointment. The only way to get the ink is to order it, so if you plan on getting this printer be sure to stock up on ink. Now the problem with that is that they say you should have ink that you are not using for a certain period of time, so if you bad more ink, it could go bad and if you don't buy extra ink you may run out when you need it. I just received my new PM400 Olympus Portable Printer. I followed instructions and it appears I have done everything correctly. I chose the PM400 to replace my Olympus PM290. I hadn't used it in quite awhile and when I decided to bring it out of the closet again I was having issues cleaning the printer head. Fortunately it works now and comparing it with the new PM400 I am getting excellent results with the color but the new PM400 has new advantages, such as, wireless and being able to download photos from my computer. Love the compact printers from Olympus. I hope they keep these items in the production each year. There are a lot of things I like about this printer. I got the white model and it looks very clean and compact. The set up for the printer is very easy and I can use it wirelessly which is really convenient. I have printed a handful of 4 x 6 photos and the quality is very nice. Overall, it is very user friendly, doesn't take up too much room, and produces nice photos. Excellent printer for 4x6 and 5X7 prints. Colors are brilliant and vibrant. Easy to use, once setup. I had difficulty in getting the computer and printer to communicate with each other. Called Epson Tech Support, and received no help. They suggested I call Apple Care to see if there was a problem with my Apple Air Port router. Apple was extremely helpful, checked all my system, found no problem, and then actually helped me with windows. Deleting the print driver installed by Epson, and allowing windows to 'find and install' the printer solved the problem. Seems amazing that I had to have an Apple rep solve a Windows problem. Once configured, it works great and produces great photos. I bought this to print quickly and easily at home for a Project Life (daily) photo/scrapbook journal. It is wonderful to have photos at your fingertips in seconds. It was incredibly easy to set up and learn to use. The prints are slightly dark compared to what I set up in Photoshop Elements. The main thing I DO NOT LIKE is that the printer automatically expands every file by about 1/16 to 1/8 in on all sides. This causes that small edge to be cut off every print. I asked the tech support and they said this is to assure complete edge to edge printing. That is fine but, when I make a file in Photoshop, I want exactly what I set up. Instead, I have to shrink all my files around the edges to make sure they are sl smaller than 4 x6 in (the only size I print) so I will not have the edges cut off. We had a pm200 which worked great large screen for reviewing and editing your photos. It was great and why they ever did away with it was a dumb idea. People who buy and use these type of photo developers don't want all the computer garbage. The viewing screen is small this was a bad idea. Please bring back the pm 200 or something like it. I like Epson products but a pm400 is a big mistake. So this is my 3rd Picturemate and it is by far the worst. Not nearly as user friendly and it doesn't allow for as much photo editing as my earlier models. The option to adjust brightness or contrast is gone from this “new” model and there are not as many photo layout options either with my favorite 3x3 option gone. Another annoying feature is when printing photos on half of the photo paper, it will only allow one photo per sheet. What a waste! As far as picture quality, my old Charm produced brighter, crisper images. So dissatisfied. I hope Epson does a better job with their next models or I will be looking elsewhere.